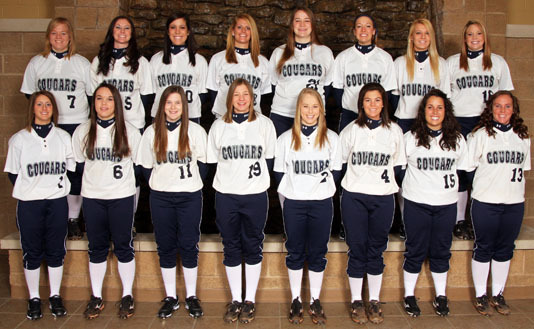 The MVNU softball team had yet to open its season before its spring break trip to Florida. The Lady Cougars were scheduled to play their first game March 5 at Salem International (W.V. ), but the game was postponed until April 9. The Lady Cougars’ only other scheduled game was at Rio Grande on March 12, but it too was canceled. The team did not officially begin its season until its spring break trip to Clermont, Fla., where the Lady Cougars were scheduled to play 12 games in all. Head coach Jeana Howald has kept the team hard at work during the prolonged preseason. “We are excited to finally get to play since our first two doubleheaders were taken away by the weather,” Howald said. “We have worked hard and are ready to bring it all together on the field. We have depth and can use different lineups. The team’s anxiety was put to rest on March 19, when it faced St. Thomas University (Fla.) for the season opener. Look for game results and a trip summary at the Lakeholm Viewer’s website, lakeholmviewer.net. The Lady Cougars play their next games April 1, at home against Point Park University.